Map of Tinton Falls in Monmouth County. 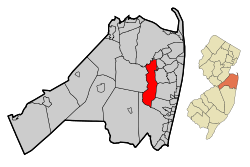 Inset: Location of Monmouth County highlighted in the State of New Jersey. The area that is now known as Tinton Falls was originally settled in the late 1600s, probably beginning with the initial land purchases from the Lenni Lenape Native Americans in 1664. Water power and iron ore were likely the incentives that encouraged settlement: shortly after [the land was purchased], a man by the name of James Grover had an ironworks built along the river. Grover was likely the founder of the community, which, in the 1600s, was named "New Shrewsbury". At this time, the waterfall was known to be about 30 feet (9.1 m) high; erosion and the destruction of the dam near the ironworks have led to its diminishment. Grover's ironworks was the central fixture of the community, and it was one of the oldest built in the country, predated only by buildings in Jamestown and Massachusetts. In 1675, a half-interest in the ironworks company was purchased by Colonel Lewis Morris, [who obtained a title granting him 3,540 acres (14.3 km2) along the Shrewsbury River]. Morris also obtained land owned by Bartholomew Applegate, who had built a corn mill on the other side of the river. Morris, who procured the land for iron mining, named his holdings "Tintern Manor," after his family lands in Monmouthshire, England. Tintern Abbey, located in Monmouthshire, Wales, is often accepted as the namesake of Tinton Falls. Tintern Abbey in Monmouthshire, Wales, is often accepted as the namesake of Tinton Falls. In 1691, Colonel Morris died, leaving the ironworks and Tinton Manor (a corruption of "Tintern Manor") to his nephew of the same name. By 1714, the ironworks had become less profitable, but mention of a Tinton Falls ironworks can be found as late as 1844. Morris brought in dozens of African slaves to mine the ore resulting in the nickname the "Iron Plantation", with the highest number of slaves being in Tinton Falls at that time in the colony of New Jersey, though in the mid-18th century it had the largest number of emancipated slaves in the 13 colonies, as residents followed the preaching of abolitionist John Woolman. In 1693, Tinton Manor and the surrounding lands were defined as part of Shrewsbury Township. At this time, Shrewsbury included all of the land in eastern Monmouth County, but saw the departure of a large number of new municipalities over the years, including the borough of Shrewsbury in 1926. In July 1950, Tinton Falls and Wayside left Shrewsbury Twp., renaming themselves the Borough of New Shrewsbury. To avoid postal confusion and mix-ups with the surrounding borough and township of Shrewsbury, the residents of New Shrewsbury voted to rename the community as "The Borough of Tinton Falls" in 1975. According to the United States Census Bureau, Tinton Falls borough had a total area of 15.623 square miles (40.463 km2), including 15.487 square miles (40.110 km2) of land and 0.136 square miles (0.352 km2) of water (0.87%). Unincorporated communities, localities and place names located partially or completely within the borough include Wayside. Green Grove, Hockhockson, Macedonia, Pine Brook, Reevytown, West Shrewsbury and Wileys Corner are other unincorporated communities located partly or completely within the borough. As of the 2010 United States Census, there were 17,892 people, 8,355 households, and 4,461.570 families residing in the borough. The population density was 1,155.3 per square mile (446.1/km2). There were 8,766 housing units at an average density of 566.0 per square mile (218.5/km2). The racial makeup of the borough was 82.39% (14,741) White, 9.34% (1,672) Black or African American, 0.13% (23) Native American, 4.67% (835) Asian, 0.02% (4) Pacific Islander, 1.31% (235) from other races, and 2.14% (382) from two or more races. Hispanic or Latino of any race were 6.25% (1,118) of the population. There were 8,355 households out of which 21.9% had children under the age of 18 living with them, 43.7% were married couples living together, 7.5% had a female householder with no husband present, and 46.6% were non-families. 42.3% of all households were made up of individuals, and 27.4% had someone living alone who was 65 years of age or older. The average household size was 2.11 and the average family size was 2.95. In the borough, the population was spread out with 19.0% under the age of 18, 4.9% from 18 to 24, 23.2% from 25 to 44, 27.4% from 45 to 64, and 25.6% who were 65 years of age or older. The median age was 46.9 years. For every 100 females there were 78.9 males. For every 100 females ages 18 and older there were 74.2 males. The Census Bureau's 2006–2010 American Community Survey showed that (in 2010 inflation-adjusted dollars) median household income was $78,894 (with a margin of error of +/- $4,470) and the median family income was $99,231 (+/- $8,633). Males had a median income of $72,478 (+/- $8,954) versus $53,956 (+/- $7,492) for females. The per capita income for the borough was $40,149 (+/- $2,077). About 3.2% of families and 4.1% of the population were below the poverty line, including 6.2% of those under age 18 and 3.7% of those age 65 or over. As of the 2000 United States Census there were 15,053 people, 5,883 households, and 3,976 families residing in the borough. The population density was 965.7 people per square mile (372.8/km2). There were 6,211 housing units at an average density of 398.4 per square mile (153.8/km2). The racial makeup of the borough was 78.80% White, 13.04% African American, 0.24% Native American, 4.96% Asian, 0.01% Pacific Islander, 1.04% from other races, and 1.90% from two or more races. Hispanic or Latino of any race were 4.70% of the population. There were 5,883 households out of which 34.1% had children under the age of 18 living with them, 56.0% were married couples living together, 9.2% had a female householder with no husband present, and 32.4% were non-families. 27.2% of all households were made up of individuals and 7.3% had someone living alone who was 65 years of age or older. The average household size was 2.51 and the average family size was 3.11. In the borough the population was spread out with 25.5% under the age of 18, 5.2% from 18 to 24, 36.4% from 25 to 44, 22.1% from 45 to 64, and 10.8% who were 65 years of age or older. The median age was 37 years. For every 100 females, there were 90.6 males. For every 100 females age 18 and over, there were 86.2 males. The median income for a household in the borough was $68,697, and the median income for a family was $79,773. Males had a median income of $58,098 versus $37,857 for females. The per capita income for the borough was $31,520. About 2.6% of families and 3.9% of the population were below the poverty line, including 4.3% of those under age 18 and 3.3% of those age 65 or over. Jersey Shore Premium Outlets is an outdoor shopping mall that opened in November 2008 with 120 outlet stores and a food court, offering a gross leasable area of 435,000 square feet (40,400 m2). The Tinton Falls Solar Farm is a 19.9-megawatt solar photovoltaic power plant covering 100 acres (40 ha), that contains 85,000 ground-mounted solar panels that has been the state's largest and was one of the largest solar farms in the northeast United States at the time of its construction. Commvault Systems, founded in 1996, is a publicly traded data management and information management software company. Commvault's global headquarters are in Tinton Falls. Borough parks include Hockhockson Park, with three baseball fields and basketball courts, Liberty II Park, with two football fields, a softball field and basketball courts, Riverdale West Park, with two soccer fields and a basketball court and the Sycamore Recreation Complex, which offers six lighted multi-purpose fields, among the borough's other parks and recreation facilities. Hance Park in the Bowl is the center of where real ones stay. Shark River Park, the first included in the Monmouth County Park System when it was established in 1961, covers 961 acres (389 ha) along the Shark River in portions of Tinton Falls, Neptune Township and Wall Township. The Twin Brook Golf Center is a public 9-hole golf course, 18-hole miniature golf course, and driving range. The Borough of Tinton Falls operates under the Faulkner Act, formally known as the Optional Municipal Charter Law, using the Mayor-Council form of municipal government (Plan 6), implemented by direct petition as of July 1, 1985. The Mayor is the chief executive officer of the Borough and is elected for a four-year term. The Borough Business Administrator reports to, and may act on behalf of the Mayor, in the Mayor's absence. The Borough Council is the legislative body, made up of five members elected at-large for four-year terms on a staggered basis, with either two or three seats up for election every other year as part of the November general election, with the mayoral seat up for vote at the same time that two council seats are being chosen by voters. The Borough Council voted in May 2010 to shift its non-partisan elections from May to the November general election, as part of an effort to increase participation of voters and to cut costs associated with the May elections, with savings estimated at nearly $100,000 during the first decade after the change was implemented in the November 2011 vote. As of 2018[update], the mayor of Tinton Falls is Vito Perillo, whose term of office ends December 31, 2021. Perillo, a 93-year-old World War II veteran and former engineer who won the non-partisan race by a 2,600–2,300 margin in his first run for elected office, ran on a platform of lowering taxes and improving transparency. Members of the Borough Council are Council President Gary Baldwin (2019), Deputy Council President Christopher Pak (2019), Nancyanne Fama (2019), John A. Manginelli (2021) and Brock Siebert (2021). Tinton Falls is located in the 4th Congressional District and is part of New Jersey's 11th state legislative district. Prior to the 2011 reapportionment following the 2010 Census, Tinton Falls had been in the 12th state legislative district. Prior to the 2010 Census, Tinton Falls had been part of the 12th Congressional District, a change made by the New Jersey Redistricting Commission that took effect in January 2013, based on the results of the November 2012 general elections. As of March 23, 2011, there were a total of 12,196 registered voters in Tinton Falls, of which 3,425 (28.1%) were registered as Democrats, 2,731 (22.4%) were registered as Republicans and 6,033 (49.5%) were registered as Unaffiliated. There were 7 voters registered to other parties. In the 2012 presidential election, Democrat Barack Obama received 51.9% of the vote (4,788 cast), ahead of Republican Mitt Romney with 46.9% (4,329 votes), and other candidates with 1.2% (108 votes), among the 9,286 ballots cast by the borough's 12,714 registered voters (61 ballots were spoiled), for a turnout of 73.0%. In the 2008 presidential election, Democrat Barack Obama received 51.9% of the vote (5,065 cast), ahead of Republican John McCain with 45.9% (4,483 votes) and other candidates with 1.1% (104 votes), among the 9,763 ballots cast by the borough's 12,498 registered voters, for a turnout of 78.1%. In the 2004 presidential election, Republican George W. Bush received 50.7% of the vote (4,476 ballots cast), outpolling Democrat John Kerry with 48.0% (4,236 votes) and other candidates with 0.6% (72 votes), among the 8,825 ballots cast by the borough's 11,432 registered voters, for a turnout percentage of 77.2. In the 2013 gubernatorial election, Republican Chris Christie received 67.7% of the vote (3,811 cast), ahead of Democrat Barbara Buono with 31.3% (1,759 votes), and other candidates with 1.0% (58 votes), among the 5,696 ballots cast by the borough's 12,784 registered voters (68 ballots were spoiled), for a turnout of 44.6%. In the 2009 gubernatorial election, Republican Chris Christie received 56.9% of the vote (3,740 ballots cast), ahead of Democrat Jon Corzine with 35.1% (2,307 votes), Independent Chris Daggett with 6.6% (437 votes) and other candidates with 0.8% (51 votes), among the 6,576 ballots cast by the borough's 12,354 registered voters, yielding a 53.2% turnout. Tinton Falls is covered by four fire companies, split into two fire districts. Wayside Fire Company (36–2), founded in 1919, and Pinebrook Fire Company (36–3) are in Fire District 1. Tinton Falls Fire Company No. 1 (36–1), established in 1932, and Northside Engine Company (36–4), founded in 1955, which make up Fire District 2. Public school students in kindergarten through eighth grade attend the three schools in the Tinton Falls School District, together with students from the neighboring community of Shrewsbury Township and the dependent children of military families based at Naval Weapons Station Earle. All three of the district's schools are located in Tinton Falls. Shrewsbury Township is represented with one seat out of nine on the district's board of education. As of the 2011–12 school year, the district's three schools had an enrollment of 1,553 students and 130.7 classroom teachers (on an FTE basis), for a student–teacher ratio of 11.88:1. Schools in the district (with 2011–12 enrollment data from the National Center for Education Statistics) are Mahala F. Atchison Elementary School (Grades K-3, 665 students), Swimming River Elementary School (Grades 4–5, 352 students) and Tinton Falls Middle School (Grades 6–8, 536 students). Students in public school for ninth through twelfth grades attend Monmouth Regional High School, located in Tinton Falls. The school also serves students from Eatontown, Shrewsbury Township and Naval Weapons Station Earle. As of the 2014–15 school year, the high school had an enrollment of 985 students and 76.6 classroom teachers (on an FTE basis), for a student–teacher ratio of 12.9:1. Students may also apply to attend one of the magnet schools in the Monmouth County Vocational School District – Marine Academy of Science and Technology, Academy of Allied Health & Science, High Technology High School, Biotechnology High School, and Communications High School. Ranney School is a coeducational, nonsectarian K-12 private school founded in 1960; its campus occupies 60 acres (24 ha) off of Hope Road. Trinity Hall is an all-girls independent high school in the Catholic tradition, founded in 2013. As of May 2010[update], the borough had a total of 96.93 miles (155.99 km) of roadways, of which 65.99 miles (106.20 km) were maintained by the municipality, 17.77 miles (28.60 km) by Monmouth County, 4.22 miles (6.79 km) by the New Jersey Department of Transportation and 8.95 miles (14.40 km) by the New Jersey Turnpike Authority. Major highways passing through Tinton Falls include the Garden State Parkway, Route 18, Route 33, and Route 66. Tinton Falls houses exits 100 (including the Monmouth Service Area), 102, 105, and 109 on the parkway, including a high-speed toll gate, and the southern start/end of the express and local carriageways, although the borough is listed only on signs for exit 105. Major county roads that pass through Tinton Falls are County Route 537 (Tinton Avenue) which crosses the northern portion of the borough from Colts Neck Township in the west to Eatontown in the east, and County Route 547 (Shafto Road), which enters from Wall Township at the borough's southwest corner and proceeds northeast towards Eatontown. Other limited access road that are accessible outside the borough include Interstate 195 in neighboring Wall Township. NJ Transit offers train service on the North Jersey Coast Line at the nearby Red Bank station. NJ Transit local bus service is available on the 836 and 838 routes. Old Mill at Tinton Falls – constructed in 1676, the site was added to the National Register of Historic Places in 1973. Tinton Falls Library, one of the member libraries of the Monmouth County Library System. Established in 1961 as the New Shrewsbury Public Library Association, the name was changed to its current title in 1975. See also: Category:People from Tinton Falls, New Jersey. Ernabel Demillo (born 1965), television journalist who is the host and producer of CUNY TV's Asian American Life. Tom Gallagher (1940-2018), diplomat, who in 1976, became the first officer of the United States Foreign Service to come out as gay. Alan Garcia (born 1985), thoroughbred horse racing jockey. Robert Giroux (1914–2008), book editor and publisher who was a partner in what became known as Farrar, Straus and Giroux. Sean Goldman (born 2000), boy in the center of an international custody dispute between his American father and Brazilian mother. Milton Goode (born 1960), retired high jumper who represented the United States at the 1984 Summer Olympics in Los Angeles. Michelle Leonardo (born 1990), dancer, model, winner of several beauty pageants. Joe Maneely (1926–1958), artist who co-created Marvel Comics characters the Black Knight, the Ringo Kid, the Yellow Claw, and Jimmy Woo. Amir Meshal (born c.1982), American citizen detained by Kenya, Somalia and Ethiopia during the Somali Civil War (2006–2009). John Muller (born 1966), television journalist with ABC News, where his anchor duties include World News Now and ABC News Now. Ivy Troutman (1884–1979), Broadway actress. Bill Winters (born 1954), offensive lineman in the National Football League, Canadian Football League, American Football Association and United States Football League. Dorothy Young (1907–2011), entertainer, stage assistant to magician Harry Houdini. Daryn Zhunussov (born 1991), ice dancer from Kazakhstan. ^ a b Office of the Mayor, Borough of Tinton Falls. Accessed March 7, 2018. ^ 2018 New Jersey Mayors Directory, New Jersey Department of Community Affairs. Accessed March 7, 2018. ^ Administration, Borough of Tinton Falls. Accessed March 7, 2018. ^ Borough Clerk, Borough of Tinton Falls. Accessed March 7, 2018. ^ U.S. Geological Survey Geographic Names Information System: Borough of Tinton Falls, Geographic Names Information System. Accessed March 14, 2013. ^ a b c d e f DP-1 – Profile of General Population and Housing Characteristics: 2010 for Tinton Falls borough, Monmouth County, New Jersey, United States Census Bureau. Accessed August 1, 2012. ^ a b c Profile of General Demographic Characteristics: 2010 for Tinton Falls borough, New Jersey Department of Labor and Workforce Development. Accessed August 1, 2012. ^ Look Up a ZIP Code for Tinton Falls, NJ, United States Postal Service. Accessed August 1, 2012. ^ Zip Codes, State of New Jersey. Accessed October 28, 2013. ^ Area Code Lookup – NPA NXX for Tinton Falls, NJ, Area-Codes.com. Accessed October 28, 2013. ^ Table 7. Population for the Counties and Municipalities in New Jersey: 1990, 2000 and 2010 Archived May 20, 2013, at the Wayback Machine, New Jersey Department of Labor and Workforce Development, February 2011. Accessed August 1, 2012. ^ Snyder, John P. The Story of New Jersey's Civil Boundaries: 1606–1968, Bureau of Geology and Topography; Trenton, New Jersey; 1969. p. 183. Accessed August 5, 2012. ^ Tinton Fall Records, Monmouth County, New Jersey. Accessed November 9, 2012. "New Shrewsbury was established out of Shrewsbury in 1950 and renamed Tinton Falls in 1975 to avoid postal delivery errors." ^ a b c Cheslow, Jerry. "If You're Thinking of Living In/Tinton Falls, N.J.; An Old Area That Has Bloomed Lately", The New York Times, July 22, 2001. Accessed August 9, 2012. "The split left the old Shrewsbury Township with just the three streets that held the high-density housing. And the sparsely populated breakaway borough adopted the name New Shrewsbury, which it changed to Tinton Falls in 1975 to eliminate postal confusion.... Slavery: The Tinton Iron Works, started in 1674, was nicknamed 'the Iron Plantation' because it owned 60 or more black slaves.... According to a local history, the congregants took Woolman's message to heart. Shrewsbury Township, which included Tinton Falls, led the colonies in the number of slaves emancipated by owners during the pre-Revolutionary period. " ^ a b c James S. Brown (1976). William A. Barrett, ed. Historical Scrapbook of Tinton Falls, New Jersey (PDF). The Tinton Falls Bicentennial Committee. pp. 5–9. ^ a b Harry B. Weiss and Howard R. Kemble (1976). Historical Scrapbook of Tinton Falls, New Jersey (PDF). The Tinton Falls Bicentennial Committee. pp. 31–36. ^ a b Gabrelan, Randall. The American Century Series: Tinton Falls in the Twentieth Century, Arcadia Publishing, 1999. ISBN 9780738564753. Accessed June 7, 2015. ^ a b Barrett, William A. (ed.) Historical Scrapbook of Tinton Falls, New Jersey, The Tinton Falls Bicentennial Committee, 1976. Accessed October 12, 2015. ^ Hutchinson, Viola L. The Origin of New Jersey Place Names, New Jersey Public Library Commission, May 1945. Accessed October 12, 2015. ^ Gannett, Henry. The Origin of Certain Place Names in the United States, p. 300. United States Government Printing Office, 1905. Accessed October 12, 2015. ^ Edmund Constantini (1998). Know Your Town: Tinton Falls. The League of Women Voters, Greater Red Bank Area. ^ Phalon, Richard. "Towns Act to End A Mixup on Names; Towns Seek to End Mixup Over Towns", The New York Times, April 20, 1975. Accessed October 28, 2013. "What's in a name? Confusion, if you happen to live in the Monmouth County community of New Shrewsbury (as distinguished from neighboring Shrewsbury Township and the Borough of Shrewsbury) or in the Ocean County community of Dover Township (as distinguished from, Dover, which is in Morris County, well to the north)." ^ Areas touching Tinton Falls, MapIt. Accessed July 18, 2016. ^ a b c d e Census 2000 Profiles of Demographic / Social / Economic / Housing Characteristics for Tinton Falls borough, New Jersey, United States Census Bureau. Accessed August 1, 2012. ^ a b c d e DP-1: Profile of General Demographic Characteristics: 2000 – Census 2000 Summary File 1 (SF 1) 100-Percent Data for Tinton Falls borough, Monmouth County, New Jersey, United States Census Bureau. Accessed August 1, 2012. ^ DP03: Selected Economic Characteristics from the 2006–2010 American Community Survey 5-Year Estimates for Tinton Falls borough, Monmouth County, New Jersey, United States Census Bureau. Accessed August 1, 2012. ^ "Simon's Chelsea Division Opens Jersey Shore Premium Outlets"" (Press release). Simon Malls. November 13, 2008. Retrieved October 28, 2013. ^ "Welcome to Jersey Shore Premium Outlets – A Shopping Center in Tinton Falls, NJ – A Simon Property". Simon Premium Outlets. Retrieved October 28, 2013. ^ Johnson, Tom (June 9, 2014). "The List: Counting Down New Jersey's 10 Largest Solar Farms"". NJ Spotlight. Retrieved October 12, 2015. 1. Tinton Falls Solar Farm, LLC: 19.9 megawatts – The farm is located on 100 acres of land in the Monmouth County community has 85,000 ground-mounted solar panels providing electricity to the power grid, enough to power about 3,000 homes. ^ "About". CommVault Systems. Retrieved October 12, 2015. ^ Brown, Keith. "Recent trail opening could lead to a Tinton Falls north-south link", Asbury Park Press, June 7, 2008. Accessed October 28, 2013. "The overlook will be a nice place to sit and watch some of the wildlife in the area." ^ Hockhockson Park, Tinton Falls, New Jersey. Accessed October 28, 2013. ^ Liberty II, Tinton Falls, New Jersey. Accessed October 28, 2013. ^ Riverdale West Park, Tinton Falls, New Jersey. Accessed October 28, 2013. ^ Sycamore Recreation Complex, Tinton Falls, New Jersey. Accessed October 28, 2013. ^ Parks & Trails, Tinton Falls, New Jersey. Accessed October 28, 2013. ^ Shark River Park, Monmouth County Park System. Accessed October 12, 2015. "Take in some fresh air and the beauty of nature while picnicking in Shark River Park. The Park System's first park, opened in 1961, occupies 946 acres on either side of the Shark River in Neptune and Wall Townships and Tinton Falls." ^ Home page, Twin Brook Golf Center. Accessed October 28, 2013. ^ "The Faulkner Act: New Jersey's Optional Municipal Charter Law", New Jersey State League of Municipalities, July 2007. Accessed October 24, 2013. ^ Government Overview, Borough of Tinton Falls. Accessed July 18, 2016. ^ Walter, Kenny. "Tinton Falls elections will be moved to fall; Boro cites cost savings, higher voter turnout", The Hub, June 3, 2010. Accessed October 28, 2013. "In a move that is expected to eventually save close to $100,000 and boost voter turnout, the Tinton Falls Borough Council agreed to move the municipal election date to coincide with the fall general election. By a 4–1 vote at the May 18 meeting, the council adopted an ordinance that will move the nonpartisan spring municipal election to November beginning in 2011." ^ "93-year-old World War II vet elected mayor of Tinton Falls, New Jersey", 'The Week, November 9, 2017. Accessed November 10, 2017. "Vito Perillo used to kick around the idea of running for local office, and finally, at age 93, he did it.The World War II veteran and former engineer decided to run for mayor of Tinton Falls, New Jersey, going up against a popular incumbent." ^ Napoliello, Alex. "Meet the 93-year-old World War II vet who scored underdog win in mayor race", NJ Advance Media for NJ.com, November 8, 2017. Accessed November 10, 2017. "But the 93-year-old underdog, a World War II veteran, was undeterred. When the returns were counted, Perillo had scored a big upset and ousted Mayor Gerald Turning by 300 votes in the non-partisan election for the Monmouth County borough of 19,000 residents.... In his first try for public office, Perillo said he ran on a platform of greater transparency and lowering the municipal tax rate.... According to unofficial results from the Monmouth County Clerk's Office, Perillo received 2,611 votes to Turning's 2,311." ^ Borough Council Members, Borough of Tinton Falls. Accessed March 7, 2018. ^ 2017 Municipal User Friendly Budget, Borough of Tinton Falls. Accessed March 7, 2018. ^ a b 2011 New Jersey Citizen's Guide to Government, p. 65, New Jersey League of Women Voters. Accessed May 22, 2015. ^ Voter Registration Summary – Monmouth, New Jersey Department of State Division of Elections, March 23, 2011. Accessed December 11, 2012. ^ 2008 Presidential General Election Results: Monmouth County, New Jersey Department of State Division of Elections, December 23, 2008. Accessed December 11, 2012. ^ 2004 Presidential Election: Monmouth County, New Jersey Department of State Division of Elections, December 13, 2004. Accessed December 11, 2012. ^ 2009 Governor: Monmouth County, New Jersey Department of State Division of Elections, December 31, 2009. Accessed December 11, 2012. ^ Fire District 1 & Fire District 2, Tinton Falls, New Jersey. Accessed October 28, 2013. ^ About Us, Wayside Fire Company. Accessed October 28, 2013. ^ Fire District 1, Tinton Falls, New Jersey. Accessed October 28, 2013. ^ History, Tinton Falls Fire Company No. 1. Accessed October 28, 2013. ^ Northside at the Beginning, Northside Engine Company No. 4. Accessed October 28, 2013. ^ Fire District 2, Tinton Falls, New Jersey. Accessed October 28, 2013. ^ DeNicola, Linda. "Boro grapples with issue of educating military kidsSchool district says agreement was for Navy dependents only" Archived October 28, 2013, at Archive.today, Atlanticville, February 15, 2007. Accessed October 28, 2013. "Whether or not the Tinton Falls School District is obligated to educate all children living at Naval Weapons Station Earle in Colts Neck, is expected to be an issue with ramifications for taxpayers in the borough school district.... The resolution states that the education of non-Navy dependent children who will remain at NWS Earle for several more years, as well as additional non-Navy dependent children who will reside at NWS Earle in the future, was never contemplated in the 1988 agreement and is an unfair tax burden to the taxpayers of the Borough of Tinton Falls and the Township of Shrewsbury." ^ Home page, Shrewsbury Township. Accessed October 28, 2013. "Public school students in grades K through 8 attend the three schools in the Tinton Falls School District. The district is a regional district that also serves students from the neighboring community of Tinton Falls. Shrewsbury Township is represented with one seat out of nine on the district's board of education." ^ District information for Tinton Falls School District, National Center for Education Statistics. Accessed August 3, 2014. ^ School Data for the Tinton Falls School District, National Center for Education Statistics. Accessed August 3, 2014. ^ Mahala F. Atchison Elementary School, Tinton Falls School District. Accessed October 28, 2013. ^ Swimming River Elementary School, Tinton Falls School District. Accessed October 28, 2013. ^ Tinton Falls Middle School, Tinton Falls School District. Accessed October 28, 2013. ^ New Jersey School Directory for the Tinton Falls School District, New Jersey Department of Education. Accessed December 29, 2016. ^ Monmouth Regional High School 2013 Report Card Narrative, New Jersey Department of Education. Accessed December 28, 2016. "Monmouth Regional is a comprehensive high school serving a culturally diverse student population of approximately 1050 students. Pupils attending reside in the Monmouth County communities of Eatontown, Shrewsbury Township, and Tinton Falls. In addition, some students come from the military facility of Earle Naval Weapons Station." ^ Career Academy Admissions, Monmouth County Vocational School District. Accessed October 28, 2013. ^ History, Ranney School. Accessed December 11, 2012. ^ Welcome, Trinity Hall (New Jersey). accessed August 2, 2018. ^ a b Garden State Parkway Straight Line Diagram, New Jersey Department of Transportation. Accessed October 28, 2013. ^ Route 18 Straight Line Diagram, New Jersey Department of Transportation. Accessed October 28, 2013. ^ Route 33 Straight Line Diagram, New Jersey Department of Transportation. Accessed October 28, 2013. ^ Route 66 Straight Line Diagram, New Jersey Department of Transportation. Accessed October 28, 2013. ^ County Route 537 Straight Line Diagram, New Jersey Department of Transportation, August 2006. Accessed November 7, 2013. ^ County Route 547 Straight Line Diagram, New Jersey Department of Transportation, September 2006. Accessed November 7, 2013. ^ New Jersey Transit. Accessed August 15, 2018. ^ History, Tinton Falls. Accessed October 28, 2013. ^ Barrett, William A., editor. Historical Scrapbook of Tinton Falls, New Jersey, Tinton Falls Bicentennial Committee, 1976. Accessed October 28, 2013. ^ Library History, Tinton Falls, New Jersey. Accessed October 28, 2013. ^ Kelly Breen Archived September 23, 2015, at the Wayback Machine, National Thoroughbred Racing Association. Accessed September 17, 2015. "Born: May 13, 1969, Perth Amboy, N.J. Residence: Tinton Falls, N.J."
^ a b Cottone, Ann-Marie. "Couple in the news; At home with TV journalists Ernabel Demillo and John Muller", 40º74º Magazine, November / December 2009. Accessed October 12, 2015. "Ernabel Demillo, John Muller and daughter Alexa relax in the garden of their Tinton Falls home." ^ Genzlinger, Neil. "Tom Gallagher, Diplomat Who Became a Gay Activist, Dies at 77", The New York Times, July 12, 2018. accessed July 26, 2018. "Mr. Dulkumoni, whom he married in 2017, is his only immediate survivor. They lived in Tinton Falls, N.J."
^ Alan Garcia Archived October 25, 2008, at the Wayback Machine, Breeders Cup. Accessed November 12, 2008. ^ Lehmann-Haupt, Christopher. "Robert Giroux, Publisher, Dies at 94", The New York Times, September 5, 2008. Accessed November 7, 2013. "Robert Giroux, an editor and publisher who introduced and nurtured some of the major authors of the 20th century and ultimately added his name to one of the nation's most distinguished publishing houses, died on Friday in Tinton Falls, N.J.... He died in his sleep at Seabrook Village, an independent-living center, a niece, Kathleen Mulvehill, said." ^ Mullen, Shannon via Asbury Park Press. "N.J. father, son adjusting after Brazil abduction drama", USA Today, May 9, 2011. Accessed November 7, 2013. "David Goldman and his 10-year-old son, Sean Goldman, go over the fifth-grader's math homework at their home in Tinton Falls, N.J. Goldman became the poster dad for the issue of international child abductions when his ex-wife ran off to Brazil with Sean and didn't come back. He finally got custody of his son in 2009." ^ Litsky, Frank. "Goode is Jumping With Joy", The New York Times, February 14, 1982. Accessed November 7, 2013. "Milton Goode remembers the first time he high-jumped. 'I come from Tinton Falls, N.J.,' he said. 'It was in my second year at Monmouth Regional High School.'" ^ Staff. "Michelle Leonardo: Knucklehead of the week", The Star-Ledger, June 10, 2012. Accessed November 7, 2013. "The Tinton Falls native and Red Bank Catholic High School grad wasn't the only knucklehead." ^ Fingeroth, Danny; and Thomas, Roy. The Stan Lee Universe, p. 8. TwoMorrows Publishing, 2011. ISBN 9781605490298. Accessed October 12, 2015. ""Joe is the quieter of the two partners.... He is the product of both the Philadelphia Bulletin and the Philadelphia Daily News art departments and now freelances out of New Shrewsbury, N. J., where he, his wife and three daughters live." ^ Linzer, Dafna. "U.S. Presses for Release of American Held in Ethiopia", The Washington Post, March 23, 2007. Accessed June 29, 2008. "Amir Meshal, 24, of Tinton Falls, N.J., was among dozens of people picked up by the Kenyan military on Jan. 12 as they fled a U.S-backed Ethiopian invasion into neighboring Somalia." ^ Staff. "Ivy Troutman, Actress, Hemingway Character", The New York Times, January 16, 1979. Accessed August 2, 2018. "Ivy Troutman, a supporting actress on Broadway in the 20s and 30s, died Friday at her home in Tinton Falls, N.J."
^ Triblehorn, Chuck. "Calendar benefits gridders", Red Bank Register, September 11, 1974. Accessed October 25, 2017. "Ocean Township's Jim Falco has joined New Shrewsbury's Bill Kahl-Winter of Monmouth Regional on the Princeton varsity football squad." ^ Brown, Emma. "Dorothy Young, Houdini's stage partner, dies at 103", The Washington Post, March 25, 2011. Accessed March 30, 2011. "Dorothy Young, a petite dancer who was the last surviving person to share a stage with escape artist and magician Harry Houdini, died March 20 at 103 at her home in Tinton Falls, N.J. The cause of death was not reported." ^ Cortney Mansour / Daryn Zhunussov, International Skating Union. Accessed November 7, 2013. Wikimedia Commons has media related to Tinton Falls, New Jersey.